Are you hosting Thanksgiving dinner this year? Listen, we all know that centerpieces can be expensive and often don’t turn out just the way you’d like. I’ve done spending hundreds of dollars on flowers for events before. I’ve done it and I’m done with it. Do you want to know how I decorated my harvest table for tomorrow? Well, I’ll tell you. I went on a scavenger hunt. Yes, I looked around the house for things that fit my theme. This year my theme was focused on the blanket that my grandmother made for her own dowry as a young girl in Argos, Greece. It’s nearly 100 years old. Something about it just screams Native American to me, so I brought it downstairs, shook it out, and there was the beginning of my harvest table. Well the tablecloth, anyway. After that, I went all over the house taking things that went with the color scheme and over-all feeling. 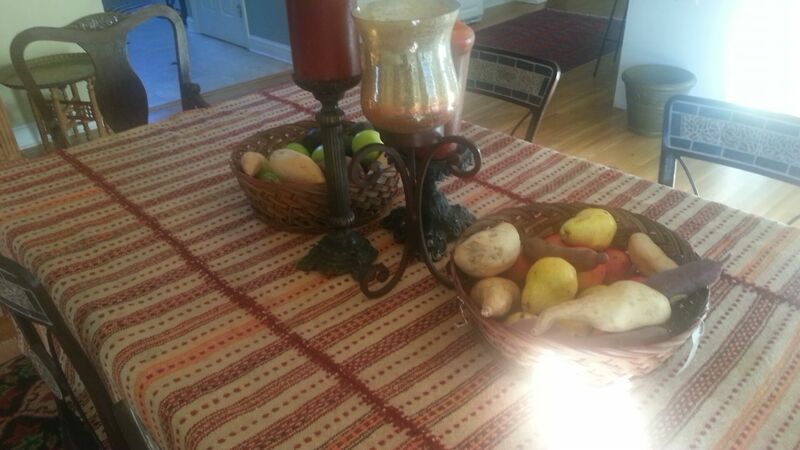 I brought brightly colored root veggies and squashes to the table in big baskets. You can grab doilies, picture frames, whatever you find. You could call the look “shabby-chic” which is very in right now, but I call it inexpensive, personal and creative. I love that combination! My favorite touch is this. Mirrors. Dust them off first, of course, and anything you put on the table or around food. Lay them facing up under platters or bowls. Even on a buffet style table this has an amazing effect! The final element is candles. I used pillar candles in my color scheme. I don’t like spending tons of money on decor when I can tap into my creativity and have so much fun making something look good from what I already have. I certainly don’t like buying toss-away decorations. So this is my answer. DIY, people! And as you’re opening closets and drawers and perusing your stock of goods, take time to give thanks for all the precious things. Things like family heirlooms and pictures of your children. Have a Happy Thanksgiving, friends.